Okay, let me just say it now… I adore Katherine and Brad! I’ve had some very sudden weird health issues and the person who has checked in the most, offered really thoughtful suggestions and been so gracious when I had to reschedule their engagement session… was Katherine. The first thing Brad did after saying hello was ask me how I’m feeling. Seriously, these two had never met me in person. This was THEIR night. Their special time to document this big change in their lives as they prepare to say “I do” and they were making sure that I was feeling good. I can’t tell you how comforting it is to be surrounded by such caring and selfless people even in my business. This is why I always say my clients are my friends. THESE TWO. They are gems. My sweet mom-sistant helped me with this session and we met up with Katherine and Brad along Kelly Drive just outside of the city of Philadelphia. 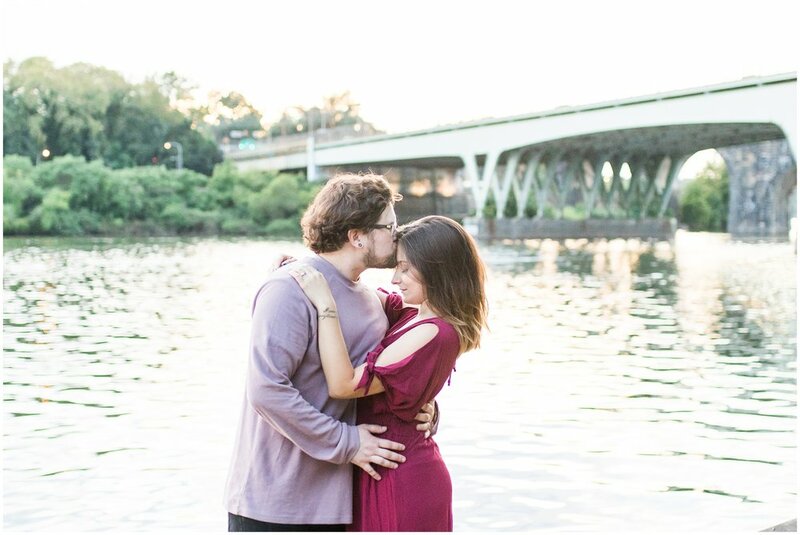 We were close to the gorgeous boathouse row, we watched SEPTA trains and freight trains roll over the bridges across the Schuylkill River and just walked and talked while the sun set and we shot these fun images! They are so fun and of course, I’m in love with their doggo, Desi. Desi wasn’t as fond of me though. HAHA It was all a little overwhelming for him. Understandably. Katherine and Brad are planning an autumn wedding in a fantastic art museum within the city. Their ceremony will be at a city park with a really amazing mural. Seriously. Close your eyes and picture it. Just the perfect mix of offbeat badassery and classy gorgeousness. I’m dying of excitement already. Enjoy some of my favorites from Katherine and Brad’s Philadelphia engagement session! I can’t wait for their super-freakin-cool Philly wedding next fall.